I've done the steps over and over again many many times but the camera on Nexus 7 will not scan the QR code at web.airdroid.com. On my Nexus 7 what happens after a while is that I get the Airdroid Best Device Manager pop up and ask me if I want to open it, which leads back to the window which has the "Scan QR code" prompt at the bottom. Would you please give us some screenshots of this so that we can better understand your issue? You may post it here or just send the screenshots to support@airdroid.com. I can't scan the QR code in Step One using my Nexus 7 (2013), having opened the app there with the bottom bar "Scan the QR code" selected and the camera shutter open. 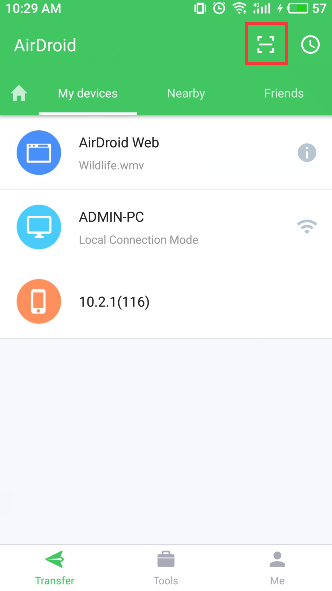 It seems that you haven't signed in to AirDroid app on your device. Would you please sign in to AirDroid on your device and then sign in to web.airdroid.com with the same AirDroid account to see if the issue still remains? I don't have an idea about how sacn QR code. I have taken the grade miners help to know how to scan the code. I am happy to get this post. When you login web AirDroid you can Scan QR code to sign in, just open Airdroid in you phone and click the scan button.